In Wired’s July 2011 issue, it talks about how feedback loops are providing an exciting opportunity for changing human behavior, presenting the case of dynamic feedback displays, or driver feedback signs, where a speed limit is posted along with a radar sensor that reads your approaching speed and displays it on a digital sign. The comprising technology is not new or revolutionary but the use of them to influence behavior is pretty inventive considering no police officers or cameras are around to issue tickets. And it appears to be working. First you need DATA – evidence and measurement of a behavior. Next you add in RELEVANCE, or social context, that provides a proxy for meaning. 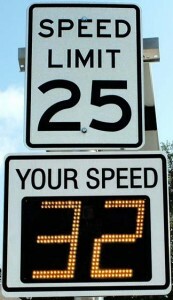 In the case of driver feedback displays, posting the speed limit next to your actual driving speed. This is called informational design. The next step is CONSEQUENCE. The information must be tied to some larger goal or purpose. Finally, you have ACTION where the party can calibrate a behavior, make a choice and do something. That action is measured and fed back into the loop where it can run again. What’s been fueling the feedback loop revolution is the cost, availability and use of sensors. They’re drastically coming down in price and an increasing in quality and utility. Ostensibly a world with ubiquitous sensors could dramatically improve human behavior, allowing people to set and achieve more definable goals, curb destructive behaviors, monitor performance and continuously improve the process. You can imagine modifying everything from eating and drinking behaviors to work patterns to energy consumption to dating. Regardless, by outsourcing our decision-making process, we are moving towards an existence where, more and more, technology performs a seemingly “human” role. And this isn’t necessarily a bad thing if it helps us save us from ourselves.